Although this isn’t a new album, it’s possible that many people haven’t heart of it. And since it’s one of my favorites, I felt an obligation to shine a light on it. 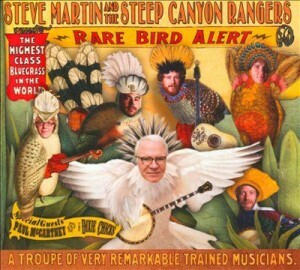 Rare Bird Alert is a modern bluegrass album by Steve Martin and the Steep Canyon Rangers. What’s that you ask, “Steve Martin of SNL and Pink Panther fame?” Why yes. For fans of Martin, this is good news, since his comedic chops do shine through here, but true bluegrass enthusiasts shouldn’t overlook this album. Rare Bird Alert includes purely instrumental songs like “The Great Remember,” soothing and meandering, and “Northern Island,” featuring banjo-picking at lightning speed. On some tracks Martin takes the lead on vocals, and on others the Rangers get the honor. Paul McCartney and the Dixie Chicks make guest appearances. Check out The Washington Post review, visit Paisley’s official site, and find his other CDs at the library. When Rosanne was eighteen, her dad, Johnny Cash, was saddened that his daughter had never heard of so many classic American songs that he felt were an essential part of their musical heritage. So the Man in Black wrote a list of 100 songs that he felt she should know. This CD features twelve of those songs, including “Girl from the North Country,” “500 Miles,” and “Heartaches by the Number.” Cash does a wonderful rendition of these classics and on some pieces is accompanied by other artists such as Bruce Springsteen and Elvis Costello. I am not a country music fan, but this CD of wonderful traditional country folk songs is beautiful and highly recommended. Listen to an NPR interview and check out a review at AllMusic.com. 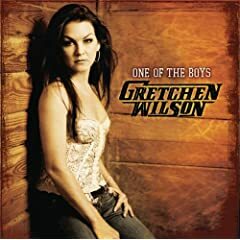 The one thing you can count on from Gretchen Wilson is that she is an original. She co-wrote 9 of the 11 songs on this album. She said it is her diary set to music. It is a country album with the steel guitars, fiddles and authentic feelings. As vulnerable as she might seem, there is the strength of a woman who knows her way and does not compromise her talent. She will rock you, make you cry, show you a good time and touch your heart. Visit CMT.com for the complete lyrics and to listen to a sample from each song.